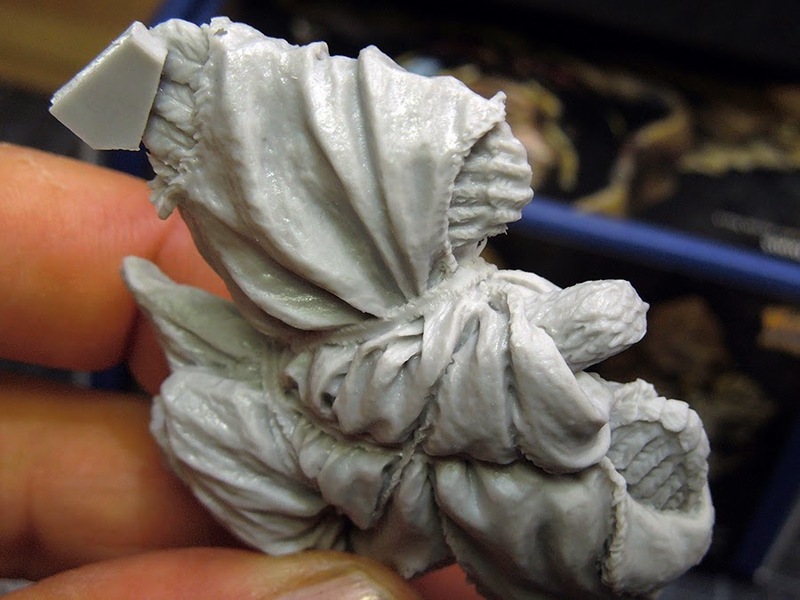 time again for another Miniatures Unpacked of a really cool bust. 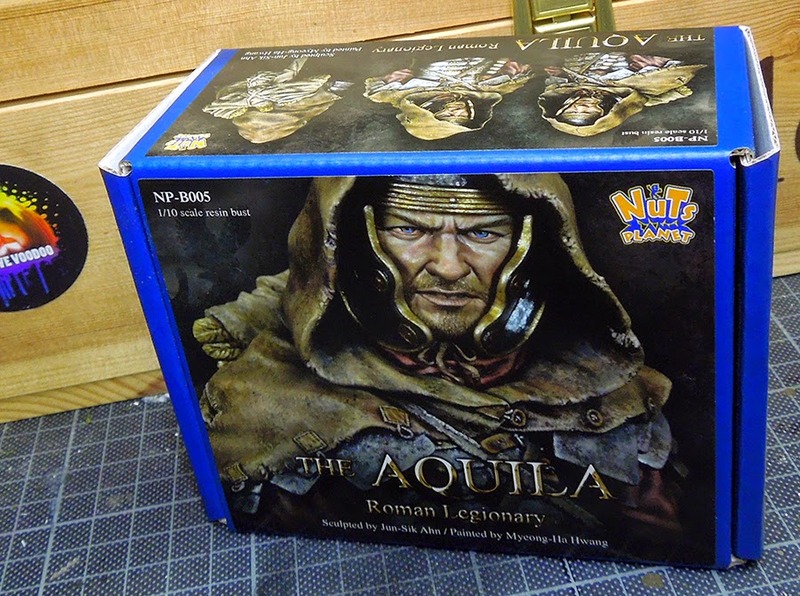 This time for Massive Voodoo's friends from Nuts Planet, "the Aquila, Roman Legionary". Roman is having this guy on his Want!-list since he saw him for the first time. He is still reading novels about ancient Rome like a madman and sometimes he is in need to let his impressions of those books loose on a figure. 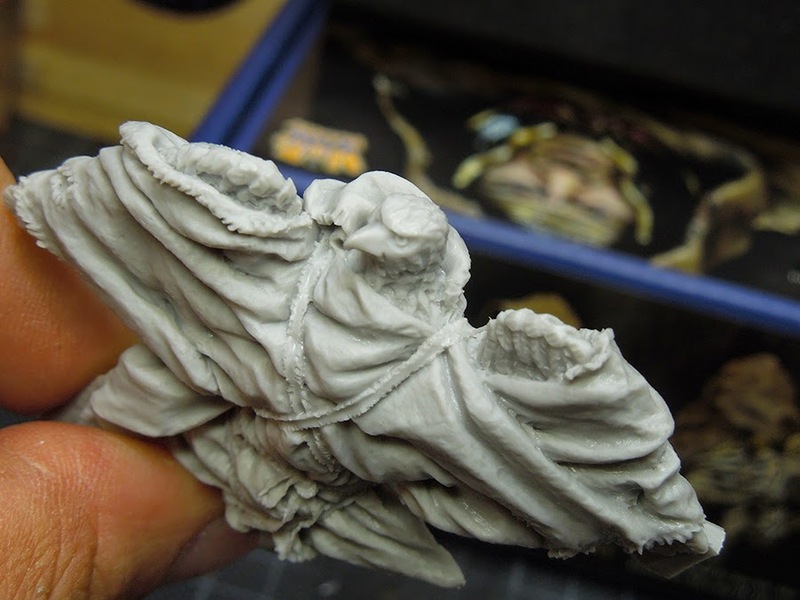 This sculpt - who tells the story of one of the retrieved legion eagles the Romans lost during several wars - is just too great to be not painted. The Model arrives in a super safe box by NutsPlanet with the very cool promotional paintjob on the box. You have one big picture of it and three small ones that let you have a good view on all the models angles. Pretty cool, but that blue of that box is just nuts! 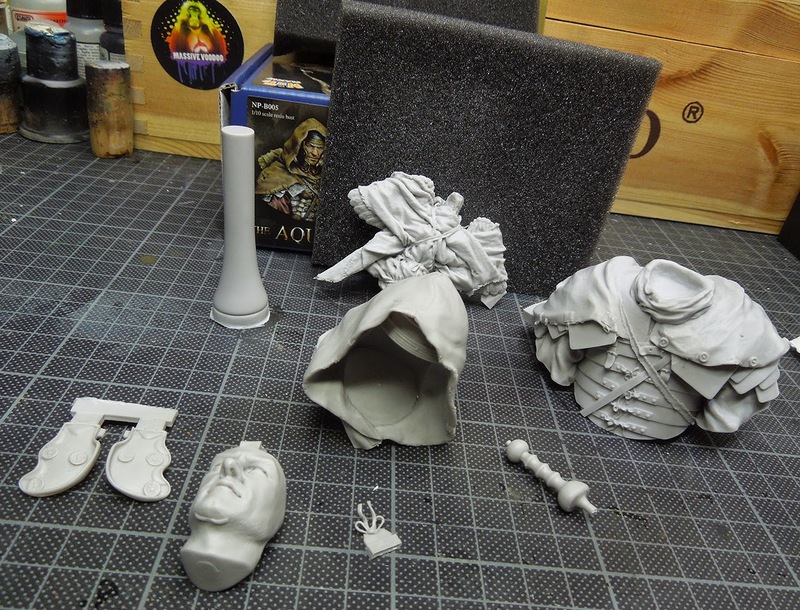 Unpacking, you'll find foam to keep everything safe inside and nine parts, including the main body, the helmet under the cloak hat, the eagle, wrapped in fabric, the pommel of the gladius, the face, the tiny straps to keep both of the helmet cheek pieces in place. Last but not least a piece of resin where you can place the bust on top if you want. 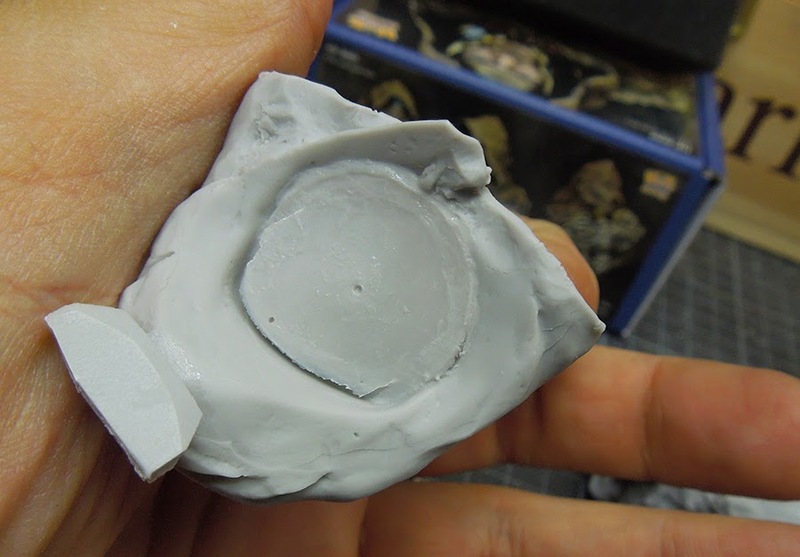 Ok, lets have a look on the quality of the sculpt and cast, which is splendid. Let's start with the most important part of the bust: The Legion's Eagle, at least this is why this guy went through barbarian hell and back to retrieve it and bring back honour to Rome. Mjam, mjam ... the detail is really cool. 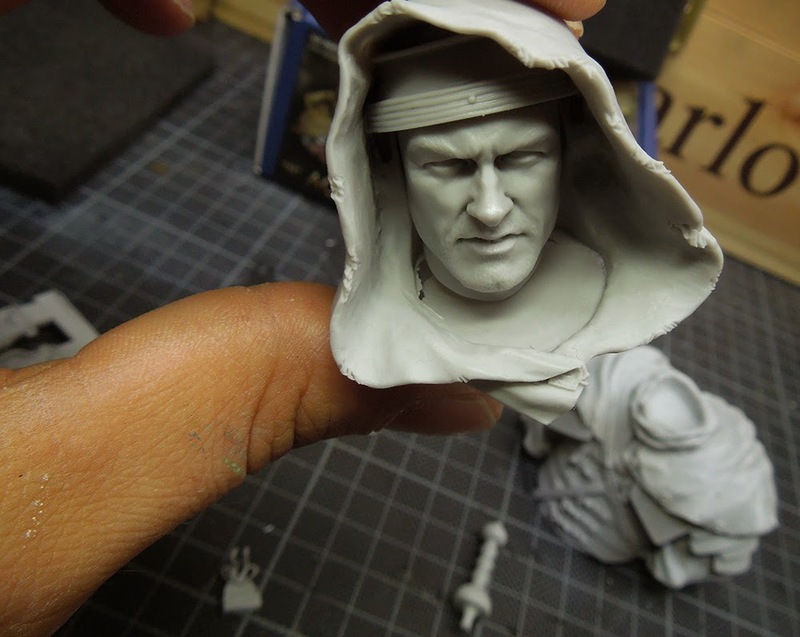 Now we have a look on the work that awaits the modeller while preparing this resin bust for painting. 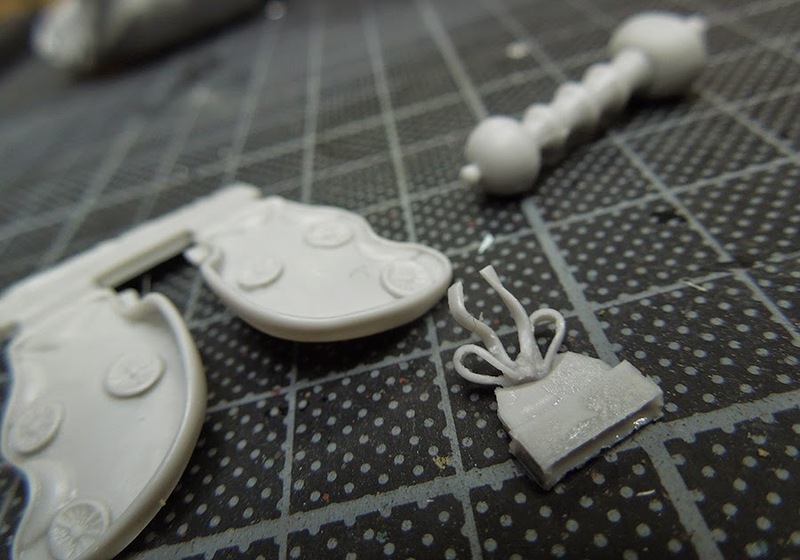 The cast quality is flawless and you only will have minor work to do while removing some small casting mould lines. On the main body, head and eagle you have some resin bricks to remove via calliper and blade. That's it. After removing a thin resin skin from the lower part of the cload the head fits in pretty good, unfortanetly for this photo the resin block was not yet removed, that is why he looks a little off balance, but yet cool. 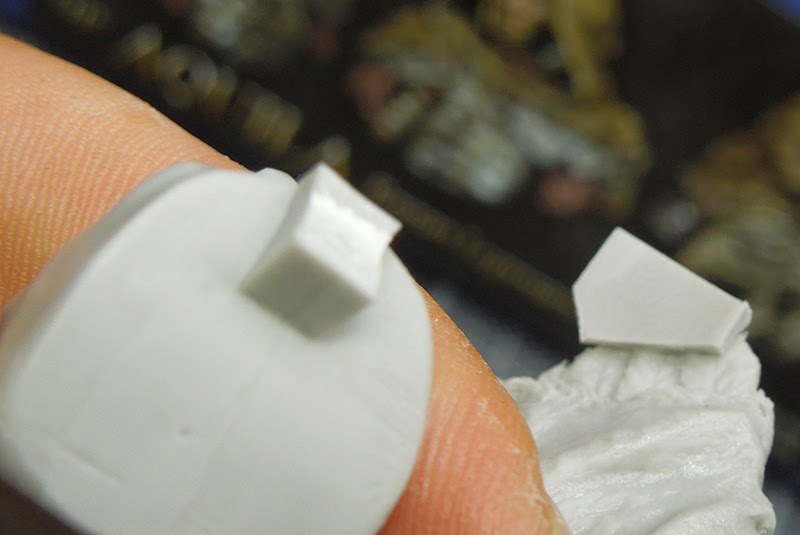 Now the resin skin is removed and the check for accuracy fit starts. Turns out to be really cool. 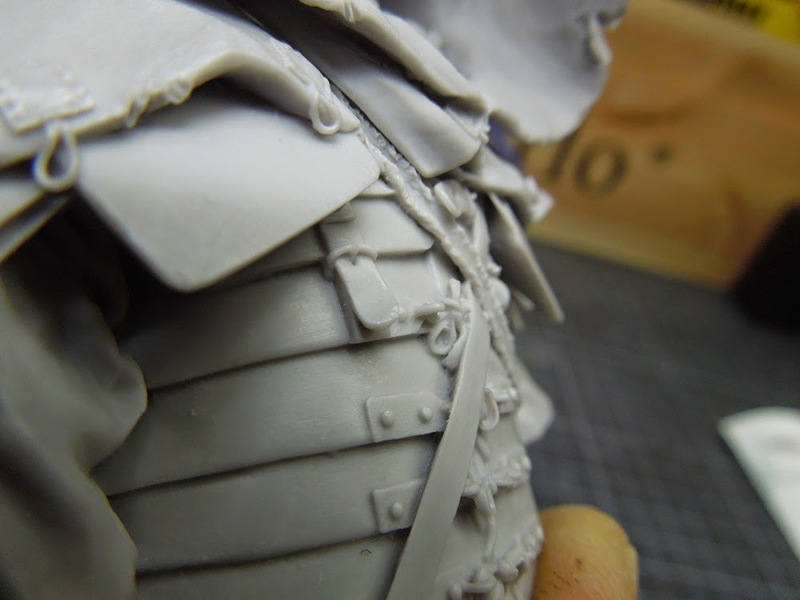 Still some remains of the resin skin have to be removed in the back of the cloak. The Eagle fits perfectly in the shape on the main body. Thumbs up, Nuts Planet! 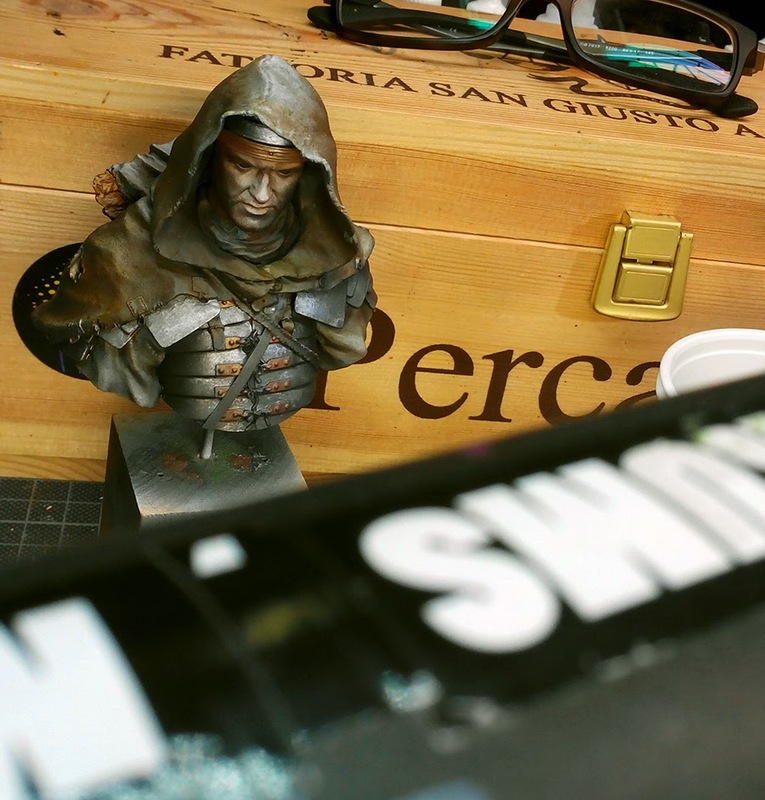 Roman's can't hold back to paint Romans so here you already can see an early WIP of the bust under Roman's brush. 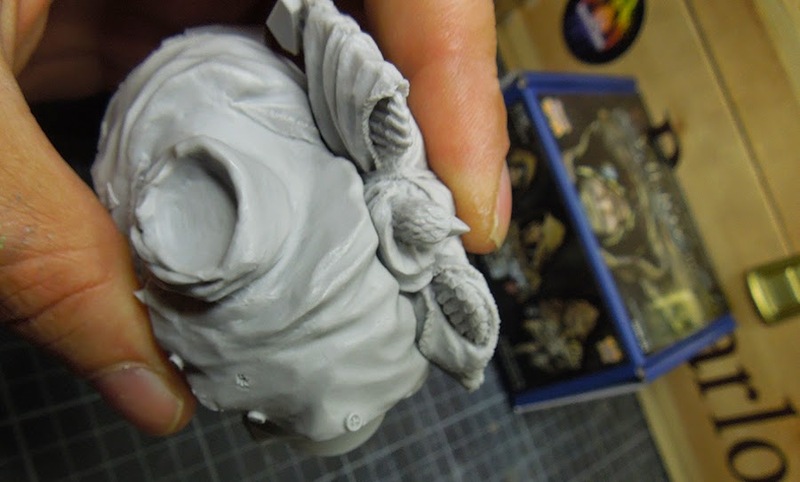 Really a cool bust - this is Massive Voodoo's second review on a sculpt by Nuts Planet and we got say: Thumbs up! High quality pieces there and a joy for every painter. If you are interested in more, check Nuts Planets' facebook page and I heard rumors that they are also started selling via retailers worldwide. 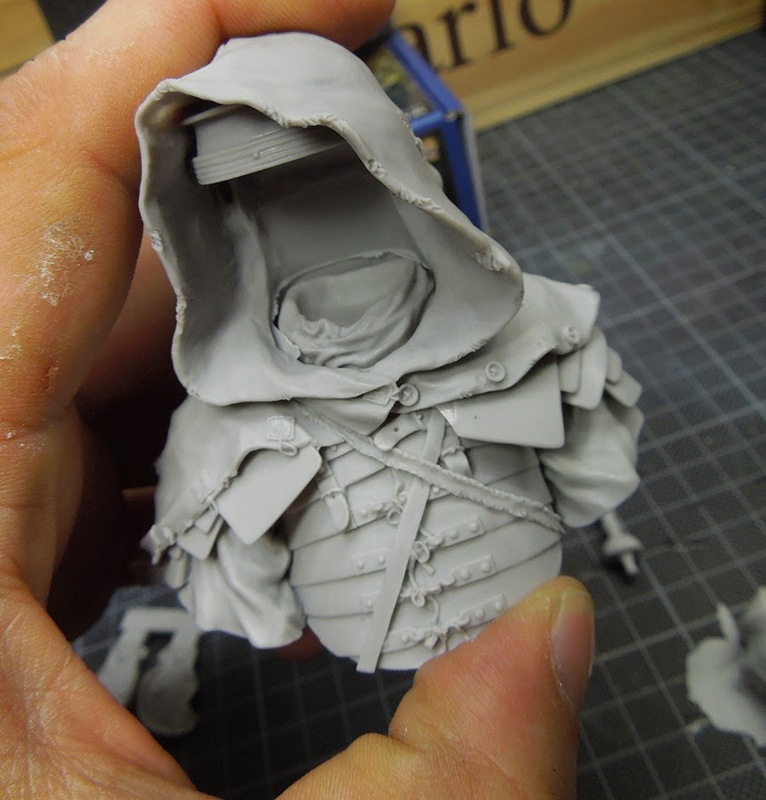 Find more reviews here via Massive Voodoo's Miniatures Unpacked Overview. he is such a cool model and your doing a great job! Thanks for taking your time for that review with its great close up pictures.